Gutter protection systems from GutterDome provide peace of mind for homeowners throughout America because they deter debris from clogging gutters and prevent the need to perform gutter cleaning. As more than 500,000 people are treated for ladder-related injuries every year in America alone, this protection is invaluable for reducing the risk of injury. And, not only do our products protect homeowners by allowing them to keep their feet firmly planted on the ground, they also prevent damage to homes’ foundations, walls, fascia and landscapes that can occur when gutters overflow. GutterDome Magma – This gutter guard style can be equipped with an integrated heat trace cable to melt ice and snow and also features a larger mesh, so it is often chosen by homeowners who live in colder climates or areas that receive high amounts of precipitation. GutterDome Adjustable – Our Adjustable style gutter guard is compatible with the Clynch Channel™ fastening system, meaning it can be installed on all homes regardless of roofing material or pitch. 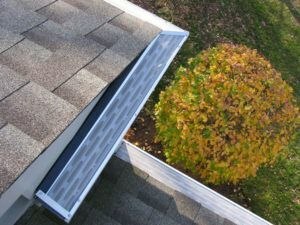 What’s more, our gutter guards are all backed by a 30-Year Lifetime Material Warranty. We are proud to offer the longest standing gutter guard warranty available today and our customers feel good knowing their investments are secure. Industry-leading gutter protection systems are available to homeowners all over North America thanks to GutterDome. To learn more or to be connected with a GutterDome Authorized Dealer in your area, contact us today.